Despite what most homeowners have been led to believe, the cost of a new driveway doesn’t need to be exceptionally high. Building a new driveway can add a lot of functionality and aesthetic appeal to your home, but it’s important that you create and commit to your budget beforehand. The cost for concrete driveway depends on many different things it may be square footage, thickness, and sub-base preparation are just a few. Only then will you be able to harness the many benefits that driveways provide – increased parking space, decreased weed growth, and better overall value for your home. In the following sections, we’ll talk a little more about how to estimate the driveway cost for your home. Gravel Driveways – These driveways are usually created by dunking a load of gravel and leveling it. Ravel driveways are cheap but require a lot of maintenance to keep it clean and to remove small dust and leaves away. This type of driveway is not suitable for children because they can choke or dig into your gravel and the gravel is too sharp for their feet. Asphalt Driveways – This type of driveway looks a lot like a tarred road and is constructed by tarring or cementing a gravel sheet. It is much cleaner than gravel driveways and many agree that it looks better than concrete driveways. Concrete driveways – This is probably the most popular driveway in the UK because it can be modified in several styles to look fantastic. Concrete driveways have a tendency to crack when they aren’t constructed correctly but are durable and easy to clean. Brick driveways – Also known as paved driveways. This type of driveway needs to be constructed correctly for a lasting effect. Brick driveways are popular in residential units and can be changed much easier than concrete or asphalt driveways. Furthermore, the bricks can also be recycled, if you decide to change your yard or driveway later on. The only disadvantage of brick driveways is that they usually require a lot of de-weeding to ensure plants do not end up damaging your driveway. Driveway Cost – How Much Is A New Driveway? In the majority of cases, the driveway cost will depend on: A) the total amount of space, B) Contractor/company, C) the cost of materials, D) the type of driveway that you will go for. Driveways will increase your property value and this makes the cost of driveways to worth the investment. If you are going to hire a paving specialist, which is always a good idea if you don’t know how to construct the driveway yourself, then make sure that you contact as many as possible to receive different quotes. Below you will find a relatively accurate estimation on driveway prices for gravel, asphalt, concrete,flagstone and brick driveways. As you can see, the cost of different types of driveways can vary quite a bit. The costs of driveway companies can also vary greatly, which can affect the overall driveway cost. To save on driveway costs, you need to do effective research on all the constructional and supply companies so you can find the most suitable construction company at the most affordable price. If you do effective planning and budgeting, then the cost of a new driveway won’t diminish your desire to get a new driveway built. 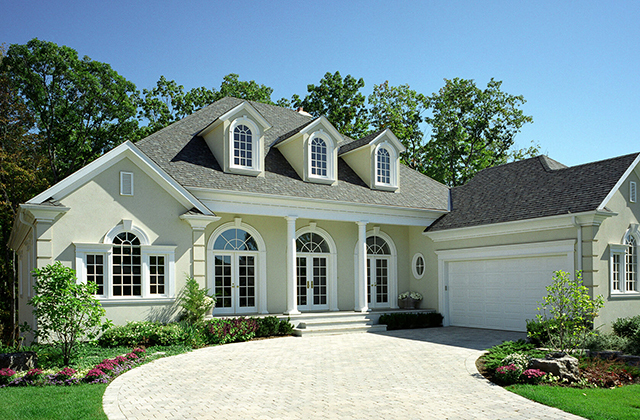 Putting down a solid foundation for your driveway will ensure that it lasts for a long time. It is best to avoid basic paving since it doesn’t last that long, which will require you to re-construct it later costing you more money. Mini-digger hire -A 5-ton mini digger will cost on average between £65 and £100 for a day, and £350 to £400 for a week. Skip hire – The average skip hire price is around £250, excluding the cost of any skip permit or parking bay suspension. Basically, as long as you’re careful about the materials, driveway type, and contractors that you choose, you shouldn’t have an issue building a driveway that suits all of your budget-related needs. Block paving first became popular in the 1980’s, but back then there were a very limited choice of styles and colours. Simple designs and a few different colours were as exciting as it got! However, since the market for block paving driveways has grown and the manufacturing industry has advanced, so too have the options. Gravel driveways : Loose materials like gravel, pebbles or shingles are a cheap driveway material. Various sizes, shapes and coloured gravel are available and are very easy to lay requiring little maintenance except topping up every so often and weeding. If your driveway is on a steep gradient loose materials like gravel will escape easily and are not a good option. A plain concrete driveway can cost $3-$10 or more a square foot, or $900-$3,000 for 12’x25′ or $2,900-$9,600 for 24’x40′, depending on soil conditions; whether existing pavement needs to be removed; drainage requirements; depth of the compacted gravel base; any slopes or curves; and any features like a turn-around or retaining wall. A concrete driveway with a single decorative element — pigmented color, textured finish, a basic border — can cost $6-$12 a square foot, or $1,800-$3,600 for 12’x25′ or $5,760-$11,520 for 24’x40′. A CostHelper reader in Virginia paid $10,255 for 903 square feet with a broom finish, or $11.36 per square foot. A concrete driveway with several decorative elements can cost $12-$18 a square foot, or $3,600-$5,400 for 12’x25′ or $11,500-$17,500 for 24’x40′. A CostHelper reader in California received a quote of $15,750 for a 1,187-square-foot stamped concrete driveway, or $13.27 per square foot. A customized driveway with multiple decorative elements — hand-applied chemical accents, multiple patterns and colors, complex and hand-applied stenciling — can cost $15-$25 or more a square foot, or $4,500-$7,500 for 12’x25′ or $14,400-$24,000 for 24’x40′. The process typically includes: removing all topsoil and organic material or any existing pavement; installing wood forms around the perimeter; adding, grading and compacting a 4″-10′ base of gravel; installing reinforcement (rebar or welded wire); pouring concrete into the forms, and smoothing and finishing the surface. Phoenix Home Services in northern Virginia provides a video overview . A new concrete driveway shouldn’t be driven on for a least a week, and heavy vehicles shouldn’t be parked on it for at least a month. A properly built and maintained concrete driveway can last 25-50 years, depending on conditions. The most ignored part of your home can become the most beautiful part of your home. Do you ignore the bathroom space? Are the bathroom walls dull and lifeless? Do you think of it as a simple space for washing and bathing? Homeowners ignore the bathroom space and do not give much thought to how much more they can get out of it. If you do not think of the bathroom, you will end up with a simple room that satisfies your basic needs only. But, if you want to increase the importance of the bathroom in your home, you have to pay attention to it and convert it into a personal spa. Northern Beaches bathroom renovations are qualified to do whatever customizations or design that you want for your new bathroom. One problem that homeowners often face while renovating a bathroom is its size. Do not despair if you feel that the bathroom is too small to give you a good spa-like experience. By making a few changes, you will be able to add more value to the bathroom. One trick that works wonders for any small room is the use of mirrors. Using large mirrors in the bathroom will help you to create the feeling of a larger room. It will enable you to make your personal spa look less cramped. Alternatively, you can opt for glass partitions for the shower area. It will ensure that the room appears bigger than usual. With the help of lighting, you will able to give the bathroom a brighter look. Also, lighting is the key factor for creating a spa-like ambience in your home. Opt for lighting fixtures that you can dim or adjust to desired levels. It will create a relaxing atmosphere. If the bathroom has access to natural light, make maximum use of it. And, if you do not have access to natural light, use artificial lighting to make the room appear bright. Do not shy away from looking for subtle crystal lighting fixtures because they will add more light and character to the bathroom. A single change in the color scheme can not only make the room spacious but also create a relaxing atmosphere. Light or neutral colors such as beige, light green or gray can be effective for a successful bathroom renovation project. You can use the same shade of tiles to create an impression of increased space. In addition, you can choose tiles that add a natural touch to the room. Use textured pebble-tiles that are soothing to the feet. You can opt for faux wood tiles that are not made from natural wood but still give the same feeling of warmth and peace. Heated flooring will also keep you warm during cold days. Accessories have a way of enhancing the design of the room. Finding the right accessories for the bathroom can help you to transform it into a personal spa. You can use simple accessories such as candles to fill the bathroom with a relaxing fragrance. You can also add towel holders and other accessories that will give an organized and clean look to the area. Even the towels that you choose for the room should evoke the feeling of being in a spa. Choose fittings that make the room appear big and comfortable. You can opt for a suspended or floating vanity that will allow the floor tiles to extend all the way to the wall. It will create an illusion of space. Alternatively, an open vanity can also add more space to the bathroom. The idea of transforming a small washing space into a relaxing retreat is a great way of making optimum use of the bathroom. It is important to list your ideas because a well-planned renovation project can ensure a successful transformation. Once you are ready with a clear vision, prepare a budget. Make sure that you use quality products and fittings that guarantee minimum maintenance. Do not think that renovating a small area doesn’t require the services of a professional. Hiring an experienced bathroom renovation contractor will transform your ideas into a beautiful reality. So, ask your friends and family members to recommend professional contractors who can handle the task of transforming a dingy bathroom into a comfortable personal spa. Affinity Renovations offers professional assistance for small as well as big renovation projects. The bathroom renovation contractor of Greater Toronto Area is the perfect choice for transforming dark, shabby bathrooms into magnificent masterpieces. Get in touch for all types of home renovation services such as basement renovation, kitchen remodeling, home painting, etc. 1. Rules and regulations. Loft conversions are subject to a complex system of regulations and permissions, which could have you running from pillar to post if it’s not something you do regularly. Any reputable company will handle all of the administrative duties for you, saving you time and giving you the peace of mind that your conversion is being carried out within the rules and regulations that apply. 2. Architect. Choosing an architect can be hit or miss if you don’t know the questions you need to be asking. Relying on friends for referrals isn’t ideal and you’ll definitely need an architect on board for your project. A reputable builder will have an architect either as part of his team or in his list of close contacts. 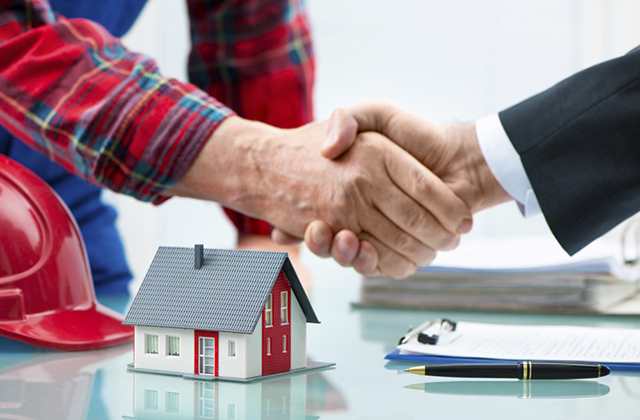 A good builder will know exactly what’s required from the architect and may indeed have negotiated lower fees than you could negotiate on your own. 3. Structural engineer. No matter what type of loft conversion you’re planning you’ll need the services of a structural engineer. The structural engineer’s job is to make sure the alterations you’re planning won’t have a detrimental effect on the structure of your home. Like choosing an architect, choosing a structural engineer is not for the faint-hearted and is best left to a reputable company who knows what makes a good structural engineer. 4. Ideas. However clear your ideas seem for your loft conversion, it’s highly likely that there’s something (albeit maybe something minor) that you won’t have thought about. A professional loft conversion company has been there, seen the film, read the book and has the tee shirt. They will be able to come up with ideas to make your project more effective; more likely to add value to your property and very importantly, be more economical. You’ll be surprised at what they’ll bring to the party. 5. Insurance. In the unlikely event that it all goes horribly wrong, if you’ve chosen a reputable company will have their insurance to fall back on. If you DIY your loft conversion, and it all goes belly-up, you’ll have no one to turn to but your bank manager! 6. Cost. In some cases, the DIY option seems, on the face of it, the cheaper option, but what many people don’t take into account is the cost of their time. If time is plentiful in your life, that’s not such a big problem, but most people these days seem to have a shortage rather than a surplus of spare time. In addition to saving you the cost of your time, a reputable builder is likely to save you money on materials and get your job done quicker than normally possible on a DIY basis. All of these add up to meaningful real cost savings and shouldn’t be taken lightly. 7. Hassle. There’s no getting away from the fact that any major house alteration is hassle! If you decide to tackle your loft conversion yourself, you’re likely to encounter your fair share of hassle. A reputable company can remove a good amount of this hassle. Even practical things like hoisting the materials directly into the loft or storing them off-site until they’re required can save lots of disruption in your home. Either way, you can be sure the intrusion in your day to day life will be minimised by getting a good team on board. 8. Support. Any DIY enthusiast knows only too well that there are few places lonelier than the middle of a project that’s just gone horribly wrong, particularly when it impacts on the whole of your household! 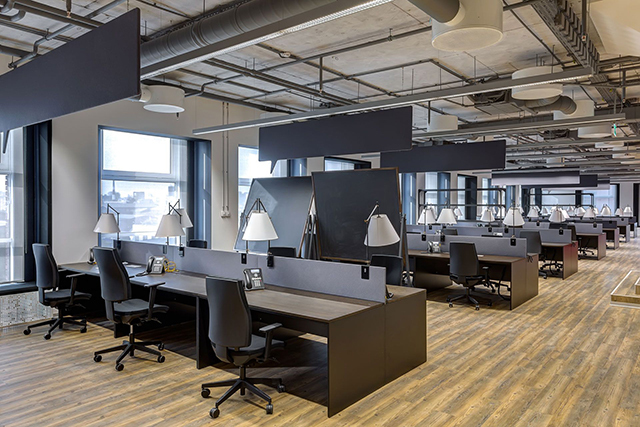 Working with a reputable firm means that your project is planned and organised to meet realistic timescales and your budget. If that firm comes up against unforeseen problems, they’ll have the experience, the experts and the manpower to sort them out. So even if you want to do some of the work yourself, make sure you have the support of a reputable company behind you if and when you need it. 9. The end result. Apart from the most exceptional DIY experts, DIY is DIY and professional work is professional work. Nowhere is this difference more evident than in the end result. The finish of a job is what gives it its polish; the finish gives it the quality people remember. Top quality finish is really difficult to achieve on a DIY project. A reputable company will make sure your project is finished to their and your exacting standards, which means that your loft conversion will be something you’ll be proud of for years to come. 10. Selling your home. Finally, an important reason to get a reputable company involved in your loft conversion, which is only too often forgotten, is the impact that a DIY loft conversion might have on the future value of your property. If you’ve converted your loft professionally, it’s likely to add significant value to your property, a DIY loft conversion, without all the relevant certificates and guarantees might just make your property impossible to sell! All in all a simple loft conversion can provide answers to numerous scenarios and can also add value as well as extra space to your existing property. However, if you ever consider having a loft conversion, whether it is a loft conversion in Bridgend, South Wales or anywhere else, remember to choose an established, reliable builder who can provide testimonials of their work. This will help to ensure that the project runs smoothly to help you realise your dreams in a relatively stress free way. In some states, you have to have your car regularly inspected. Part of that inspection should include an emissions test. If your vehicle is new, you may not have to worry as much. However, older automobiles may have trouble. Catching potential problems and fixing them in advance can save you time and frustration. To understand how an emissions test works, you first must understand what the technicians are looking for when examining your vehicle. Simply put, as your automobile uses fuel to power the engine, combustion takes place. What is left over from this process comes out of your vehicle’s tailpipe. Because of the toxicity of the outflow, inspectors must ensure that these gases are within certain levels. What Does an Emissions Test Look For? To perform this examination on your vehicle, the technician places a sampler into the tailpipe. This piece of equipment samples the exhaust coming from your engine and reads what the level of gases are in parts per million. The equipment is set to sense or “sniff” five different types of gases: NOX, O2, CO, CO2 and HC. NOX is the term for oxides of nitrogen and is produced by heating and compressing air containing nitrogen. This compound is very toxic at high levels. Oxygen is always found in the exhaust as there is always some unburned oxygen being admitted into the air. While this is not a harmful residue, O2 tells how well the engine burns through the fuel. Excessive amounts may indicate that the engine has been tampered with in order to pass the test with faulty equipment. In addition to O2 and NOX, CO and CO2 are also tested for. CO, or carbon monoxide, is a well-known, colorless, odorless compound that is deadly. CO2, better known as carbon dioxide, is a leading cause of global warming. The final compound tested for is HC or hydrocarbons. Hydrocarbon is unburned fuel. As with CO and NOX, HC is not something you want to breathe. It is the leading cause of smog seen in large cities. How Can You Pass the Emissions Test? Your car must be in fairly decent shape to pass the test. If you have not had a tune up in a while, it is important that you do so before your next inspection. Changing spark plugs, changing the oil, and having a fresh air filter can address many of the issues that your automobile may have. You should also ensure that your gas cap is free of cracks and that it fits snugly. In addition, if your vehicle has a check engine light on, you will not pass the inspection. Be sure to take your vehicle in for service when this light comes on. There are many different reasons the light could be on, and not all of them are expensive fixes. The emissions test is designed to help keep our environment clean. While it might seem like a hassle, having cleaner burning vehicles is better for everyone. In addition, you can be certain that your car is in great running condition and will be less likely to break down. How to Perform a Front End Alignment Yourself? Watch This! All of you must be aware of the fact that brakes are quite an important safety feature for cars and that is the reason as to why squeaky brakes can easily cause a driver to panic. Sometimes squeaky brakes can be a cause of genuine concern as it may signify that our brakes are going bad and at other times there may not be any reason to worry. However, it needs to be noted here that certain sounds from the car’s brakes are quite normal and are caused by different driving conditions. For example, conditions like severe braking, dusty or sandy conditions or even humidity can cause various noises from the car’s brakes. Rust on the Rotors: This is quite common and it has been seen that disc brakes of car have a tendency to squeak if they are parked out in the open air throughout the night. Most brakes squeak after sitting overnight because the moisture from the rain or dew or condensation collects on the surface of the rotors. When there is moisture on the surface of the rotors, a thin layer of rust forms on the surface. As the rotor turns, the pad scrapes the rust off the rotors and then the rust easily gets caught on the leading edge of the brake pad. The fine particles of rust get embedded into the leading edge of the pad which in turn causes a squeaking sound. This squeaking sound will continue until the rust is removed from the rotors. 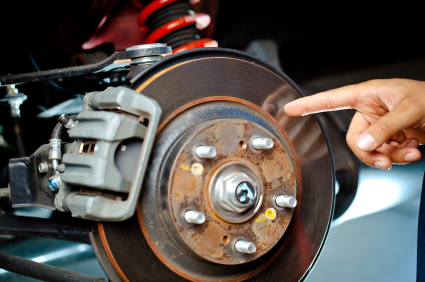 Brake Pads: Another cause of squeaking brakes can be thinning brake pads. This usually happens when the brake pads are worn out and has become extremely thin. In fact, this is an effective warning that the brake pads are in a bad condition and needs to be replaced soon so that it does not cause an untoward incident on the road. High Metal Content: It has been seen that high metal content in brake pads also cause the squeaking sound. However, it is natural that there is some amount of metal in the brake pads but some of the cheap varieties are manufactured with high metal content. In fact, large chunks of metal are embedded into the pad material. The result is that the large pieces of metal drag on the rotor and causes the brakes to squeak while the car is on the move. Lubrication: Sometimes a squeaking sound from the rear brakes are also heard after pushing the brake pedals. It indicates that the shoe-to-backing-plate contact points need to be lubricated. Once the contact point loses lubrication the metal begins to rust. When such a thing happens the shoes will scrape against the backing plate, which in turn causes a squeaking sound while the wheel rotates. If your car brakes are squeaking, it is best to get your vehicle checked by a trusted car mechanic and get his opinion on the condition of your brakes and the reason as to why they are squeaking. Remember, car brakes play an important role in maintaining the safety of the vehicle while on road and so it is always better to be safe than sorry! The plumbing of your home is one of the most important parts of your home. Eventually, because all things wear down, you will need to call a plumber in Salt Lake City to help you with your plumbing needs. While all plumbers need a fare wage, there are things you can do to minimize your costs. 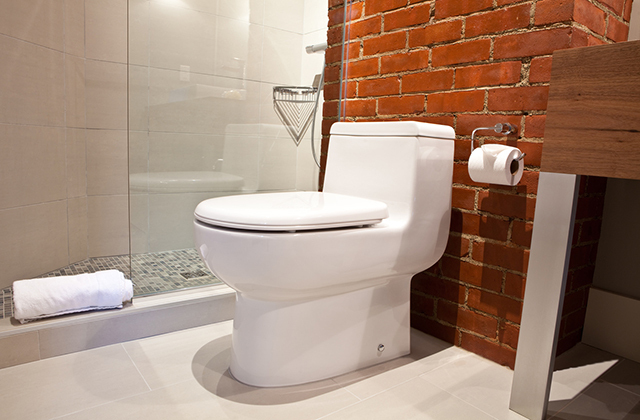 Plumber Salt Lake City should be called when you have plumbing needs. When calling a plumber, you should compare their hourly rate with other plumbers in the area. Going with the cheapest plumber may sound like the easiest way to choose your plumber, but it’s not that simple. What’s more important when comparing two plumbers than their hourly rate is their reputation in the area. A good reputation, just like the cheapest price, also doesn’t necessarily mean you are going to get the best product. A good reputation can be made from simple jobs being down well for a long period of time. Just because that plumber has a good reputation for unclogging leaks doesn’t mean they have the knowledge or the experience to tackle a big job or an emergency plumbing problem that might arise in your home. Remember that just because a company has been promoted and marketed a lot doesn’t mean they have a good track record or that they will come through when you need them most. The most important thing you can do is get explicit references from people that have had work done or go through a prescreened plumbing service. Another problem with comparing the hourly rate of two plumbers in one area is they may bill their hours differently. Travel must be factored into the final cost, and if you are in the middle of nowhere, may have to pay more. Looking for a plumbers’ overall customer satisfaction is probably the best way to select who will be best for your job. When you take everyone’s collected accounts of the service provided by a plumber, you get a good picture of what that plumber can offer you. If you are still looking for ways to save money when looking for a plumber, instead of comparing them, you could leave them out of the equation entirely. There are things you can do to save money and save a plumber call that you can do on your own. Don’t bite off more than you can chew though, or you will need to call Plumber Salt Lake City to correct your mistakes. If you don’t have the proper knowledge, a professional should be brought in. Some maintenance is very easy, however. There are three very common pipe problems with easy solutions. A plumber in Salt Lake City might tell you these very tips. First is frozen pipes. You need to ensure all your pipes are in heated spaces. If they are not in heated spaces, you need to make sure your pipes are well insulated. When the seasons change from summer to fall, you must disconnect your garden hose first, and then drain it of all liquid. You should then turn off the valve indoor and open the faucet outdoor. If you don’t have a cut-off valve indoors, you should consider having one installed. Water that is left in the pipes when the temperature becomes freezing will freeze in the pipes and this can cause problems. Next is hair build up in your pipes in the bathroom. Whether in the sink or in the bathtub or shower, if you don’t have something to block hair from going down your drain, you might eventually end up with a hair-clogged drain. Buying something to cover the drain so you can intermittently remove the hair is the first step. If you haven’t done this and you already have a clog, consider using a specially made product to remove the clog. Be careful and remember to read all precautions and directions before using any chemicals you aren’t familiar with. Last is grease build up. You can buy a product designed for this as with a hair clog, or you can try boiling hot water and a soap mixture and pouring that down the drain. Be careful with either choice. Another way to save money on your plumbing needs is to buy your own fixtures as opposed to buying the ones the plumber installs after you have chosen the right plumber for you. A plumber will normally buy the parts at wholesale prices and sell them to you with a markup on them. Plumber Salt Lake City will be able to save you money, but you might try buying your own parts too. Because home-centers now charge prices that might be less than wholesale, buying your own fixtures can save you money. Even though you might be saving money, you do need to be wary of things bought from home-centers. Usually the cheaper price comes with cheaper craftsmanship and this may affect your plumber system in a negative way. Don’t rely on cheap parts for your homes most important fixtures. Cutting corners can’t replace quality when your home is on the line, and with the possibility of the things that might fail, you should always choose quality products over saving a few bucks. Another problem with home-center products are that they sometimes might be missing parts or need additional parts or adapters for use in your home. Read the product carefully before purchase.